After Tarzan's marriage to Jane, Burroughs refers to him as "John Clayton, Lord Greystoke -- he who had been 'Tarzan of the Apes,'" as though this phase of his life were over. In The Beasts of Tarzan, Greystoke is trying to live a normal human life in England when his son is kidnapped by enemies who seem determined that both he and his son should exist in a primitive condition. Tarzan is marooned on Jungle Island, while his son is to be taken into the interior of the Dark Continent to be raised by cannibals. Even though all of these efforts by outside forces are thwarted by a savage Tarzan who has all of his powers intact, he returns to England, so his son can have the benefits of a good education there. However, the last page of the novel informs us that Tarzan already holds vast African estates in the land of the Waziri where they occasionally reside. Beasts was written in 1914, however The Eternal Lover (Part One) was written just before this time, which pictures these African estates and Greystoke's life as a rather nondescript gentleman plantation owner. Eternal Lover (Part Two) was written after Beasts and before Son, which continues this non-Tarzanic phase, and indeedSon finds a Tarzan still struggling with his own identity in civilization as his son grows into young manhood. 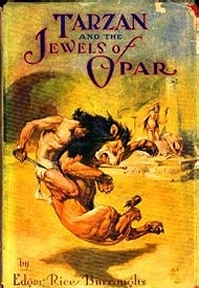 Jewels of Opar is the key novel in Lord Greystoke's return to his full Tarzanic nature, yet it comes through a period of transition which involves a severe case of amnesia. These events occurred when Tarzan pulled away from his civilized plantation and went on a journey into the deep interior of his dark Africa. Jane was worried that he should be going into danger again, but the need for money made the trip at least reasonable to her if not entirely acceptable. On the way to Opar Tarzan receives a warning from a witch-doctor that "A god greater even than you will rise up and strike you down." Given the subsequent events, one might assume that this "greater god" to be The Flaming God of the Oparians, who does have a sort of revenge upon Tarzan for his removal of the treasure from the sacred vaults of Opar. However, it could also be suggested that this "greater god" was the force of his "ape-side," so to speak, that asserts itself in his personality in ever increasing ways so that he all but abandons his civilized ways throughout the rest of his life. Tarzan's periods of home life with Jane seem to take second place to a life of wanderlust and adventure that makes him an eternal quester after new experiences rather than a sedate, occasional hunter on horseback as portrayed in Eternal Lover. One might even find in Tarzan the type described by Frank McLynn's "The Psychology of the Explorers" in chapter 16 his "Hearts of Darkness." On a simple level of conscious motivation, men such as Burton, Livingstone, and Stanley are seen to have a kind of "action neurosis," in which they found "something God-like about being the first white man in an area; it was like presiding over a new creation." Such men found "dissatisfaction with the artificiality of life in Britain," which indeed was part of a general "nineteenth-century disgust of industrialization and urbanization." They all sought "to use Mark Twain's words, to 'light out for Indian territory': to escape to virgin territory, unknown lands, to experience at first hand something of the flavour of a heroic age, when technology did not give victory to the weakest and most cowardly." McLynn also suggests "irrational impulses and unconscious drives" that "powered (these explorers) on their quest. Roughly speaking we may distinguish three deep psychological motives: a desire to return to the pleasure principle of childhood, a death drive, and a displaced, transmogrified or sublimated sexuality." His source for this theory is Melanie Klein's "Love, Guilt and Reparation" (1975). Klein suggests that "In the explorer's unconscious mind, a new territory stands for a new mother, one that will replace the loss of the real mother. He is seeking the 'promised land' -- the 'land flowing with milk and honey'." One might judge ERB's psychological transition of Tarzan to "beast again" in Jewels as being rather astute when he has him "revert" to his childhood memories at the beginning of his amnesia. He writes "His mind had reverted to his childhood days -- it was the figure of the giant she-ape, Kala, that he saw; but only half recognized. . . . His boyhood among the apes spread itself in a slow panorama before him, and as it unfolded it induced within him a mighty longing for the companionship of the shaggy, low-browed brutes of his past" (Jewels, 121-122). Indeed this longing for Kala (his ape mother) is a constant theme in the Tarzan series and may be one reason for his wandering nature. One example of this theme is presented here from "Tarzan's First Love." The ape-boy craved affection. From babyhood until the time of her death, when the poisoned arrow of Kulonga had pierced her savage heart, Kala had represented to the English boy the sole object of love which he had known. In her wild, fierce way Kala had loved her adopted son, and Tarzan had returned that love, though the outward demonstrations of it were no greater than might have been expected from any other beast of the jungle. It was not until he was bereft of her that the boy realized how deep had been his attachment for his mother, for as such he looked upon her" (Jungle Tales of Tarzan). Burroughs always seems to provide a noble reason for Tarzan's many hand-to-hand combats with dangerous beasts, so it is difficult to find a "death-wish" in this man who frequently asserts "where there is life, there is hope," even in the most desperate situations. Rather than seeking death, even unconsciously, Tarzan seems to have a rather fatalistic attitude toward the grim-reaper. As he remarks in Jewels, "Death is no great adventure to the jungle bread who walk hand-in-hand with the grim specter by day and lie down at his side by night through all the years of their lives." The only time that Tarzan had ever given up hope as far as I can recall is near the end of Tarzan the Untamed. He had just heartened his companions with "we still live!" when he receives a spear in the shoulder knocking him to the ground. In the heat of the battle ERB provides the strange statement: "Even above the roars of the lions and the screams of the maniacs, those beloved tones (of rescue) reached the ears of Tarzan and the girl at the very moment that even the ape-man had given up the last vestige of hope." There probably isn't much in Tarzan's biography to suggest a death-wish since ERB always presents him a a supreme example of healthy-minded strength and virility. If Klein's statement that "the classic sign of a death drive is an excessive aggression directed towards the external world," may be applied to Tarzan, it comes under conditions of duress. For example: at times Tarzan does kill when merely rendering an enemy unconscious would seem to do. He strangled to death a maniac guard in Tarzan the Untamed, indeed, strangled him until his eye popped out of their sockets. Tarzan's potential for aggression was acute. He was a dangerous man, and even though his actions may be excused in this case because he was on a commando mission, his propensity for falling into life-threatening situations was at least above the norm. The number of lions alone that Tarzan killed in hand-to-hand combat during his life is excessive, given the fact that he could have easily lessened the danger by carrying a gun. As for the last motive given by Klein: " a displaced, transmogrified or sublimated sexuality" one can only refer to McLynn's comment on Livingstone, who " was simultaneously fascinated and horrified by sexuality -- a typical Victorian neurosis" (McLynn, 357). Tarzan is presented by ERB as a loyal mate to Jane, even when it seems that every woman he meets is attracted by his masculine virility. There is absolutely no room in ERB's world for an unfaithful or even for a wayward hero in the matters of the heart, and sexuality is limited to hot kisses and heaving breasts. The sexual world of Burroughs is one dominated by the "typical Victorian neurosis," and is for the most part almost adolescent in its presentation of relationships between men and women in general. I suppose this state of affairs would fall under Klein's definition as "sublimated sexuality" and certainly might have been a driving force for Tarzan's wanderings since he seemed to meet so many interesting women this way. In chapter 4 of Tarzan and the Jewels of Opar, he is struck on the head by a jagged fragment of rock during an earthquake while he is in the underground treasure room beneath Opar. This blow gashes a deep cut upon his head that creates a pool of blood and plunges him into total forgetfulness. He is not knocked unconscious immediately, for he staggers backwards against the door and pushes it open before he rolls inward upon the floor. In chapter 7 we learn that Tarzan lies upon the floor for some time completely unconscious. Finally he is able to sit up, then stand shakily. He has a splitting headache, and he cannot remember the events that caused it, nor any of the events that brought him to this place. In fact, he has forgotten all of his past except for his knowledge of the ape language, which he uses to speak to La. He feels his quiver at his back and his knife, and sensing that something is missing, looks for and finds his spear. In a daze, Tarzan falls into a well, a water-trap along the passageway, but he swims out and enters a tunnel. "Along this he passed; but now he went warily, for Tarzan of the Apes was learning. The unexpected pit had taught him care in the traversing of dark passageways -- he needed no second lesson" (69). Tarzan still had his physical skills intact along with a capacity to remember -- his short-term memory. Tarzan comes upon the forgotten jewel-room of Opar and takes away a pouch of cut, precious stones because they are "pretty pebbles" pleasing to him. When he comes upon the sunlight at the end of a flight of concrete steps he views the vine-covered columns in mild wonderment. "There was a tantalizing suggestion always present in his mind that something was eluding him -- that he should know many things which he did not know" (72). When he comes into the temple he sees and recognizes men and women, and a huge lion for what they are. When the lion attacks Tarzan, he kills it with his spear and knife, then gives the cry of the bull-ape. He is Tarzan with only the memory of his past erased. When La tells him that he is Tarzan (in the vernacular of the great apes) he replies, "I am Tarzan? Well, it is a good name -- I know no other, so I will keep it; but I do not know you. I did not come hither for you. Why I came, I do not know at all; neither do I know from whence I came. Can you tell me?" (77). Tarzan then speaks easily to Werper in French, so his language skills are not at all impaired. "Slowly and painfully, recollection was attempting to reassert itself, the hurt brain was mending, as the cause of its recent failure to function was being slowly absorbed or removed by the healing process of perfect circulation." "The people who now passed before his mind's eye for the first time in weeks wore familiar faces; but yet he could neither place them in the niches they had once filled in his past life, nor call them by name" (306). His past is becoming familiar again, yet "just as success was within his grasp, the picture faded into a jungle scene where a naked, white youth danced in company with a band of hairy, primordial ape-things" (306-307). Later, Werper tells Tarzan that he is John Clayton, Lord Greystoke and comes to a sudden understanding. 'The forgotten name had reawakened the returning memory that had been struggling to reassert itself" (315). Perhaps it was because Lord Greystoke was the name that Tarzan associated with his civilized nature described in part one of this essay. I don't know about the normal functioning for amnesia, but I expect that it is different in different cases. In a personal vein, I can tell a little story of something that happened in my youth, which had a similar ending. When I was a lad I was knocked unconscious for what must have been a very short period of time by a fall that I took while running on a wet concrete floor in the locker room of a swimming pool at the local YMCA. I recall nothing of the event, but my friends must have brought me home where I vaguely remember a single moment of eating supper that evening. My worried parents continued to talk to me, and suddenly I recognized them and where I was while lying on the couch after supper. I remember my mother saying, "he knows where he is now," her statement prompted I expect by a certain look I had in my eyes. She showed me the books I had picked up at the library that afternoon, and they were all unfamiliar to me because I didn't even remember being there. One of the books had a red cover, and it was about magic. I never recovered any memories of that accident, but vividly recall the moment I became completely aware of my surrounding again. It happened in a single moment of time, so I tend to believe Tarzan's rapid recovery in this story. 3. Tarzan and the Madman - the twist is that Colin T. Randolph gets a blow on the head and thinks he is Tarzan while playing at being Tarzan. 4. Tarzan and the Castaways - a brain lesion leads to aphasia and a loss of the ability to speak or understand language. Burroughs, Edgar Rice, Beasts - Eternal Lover - Jewels - Jungle Tales - Tarzan the Untamed. Hanson, Alan, The Wondrous Words of Edgar Rice Burroughs, Waziri Publications, 1998. McLynn, Frank, Hearts of Darkness: The European Exploration of Africa, Carroll & Graf, 1993.